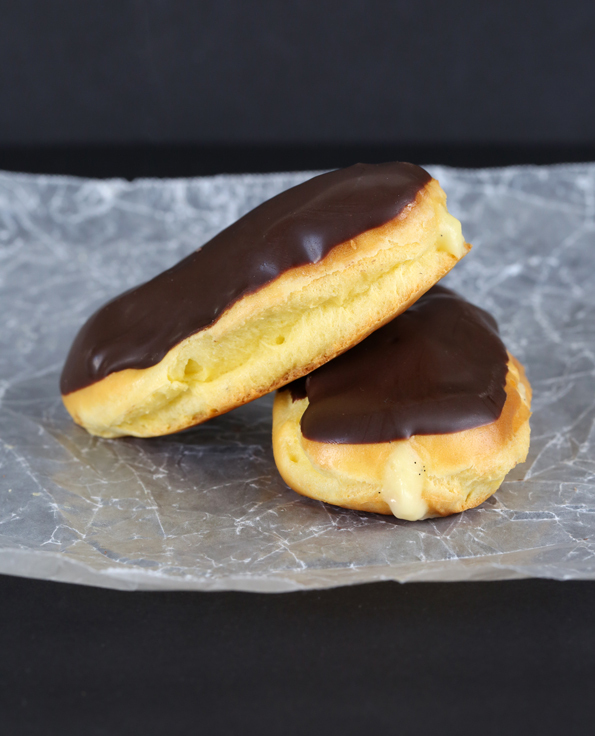 Gluten free chocolate eclairs are just fresh gf choux pastry filled with pastry cream, topped with chocolate. They’re French, but they just look fancy! 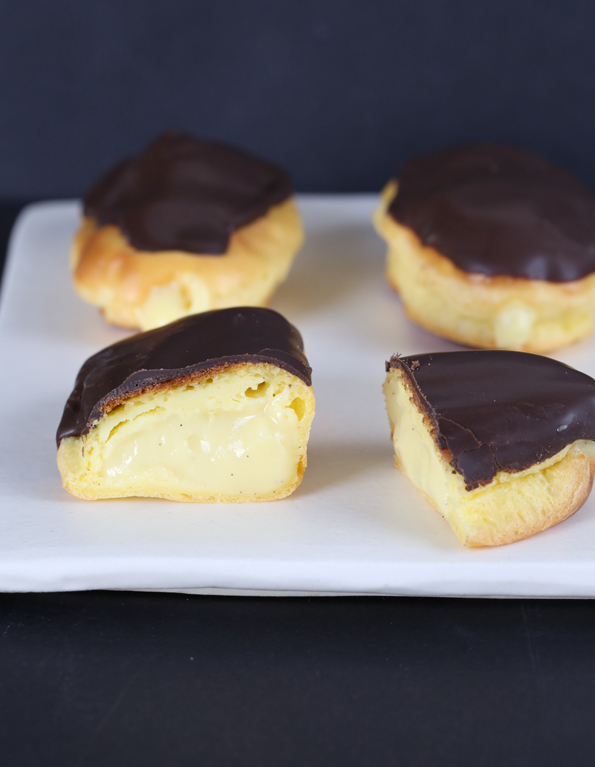 If you can make the Gluten Free Cream Puffs, you can make gluten free chocolate eclairs. It’s as simple as that. 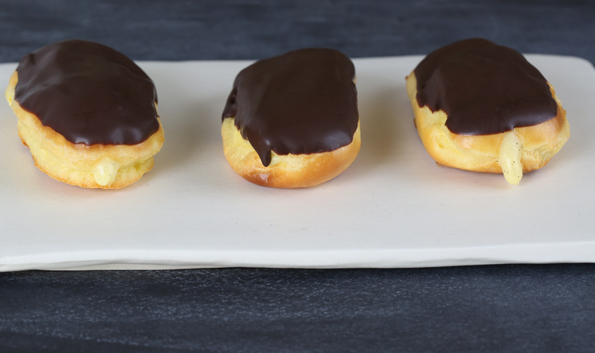 It’s all about the deceptively fancy, easy peasy gluten free choux pastry. Make it into gougéres, too, if you’re feeling savory. It just dead simple. Choux pastry is a basic French (oooh la la!) pastry dough that has no yeast, and not even any chemical leaveners like baking soda or baking powder. But it puffs up like nobody’s business. How? Eggs! That’s it. Really. Oh, and the proper method. That doesn’t hurt either. Right there in the middle, flecked with gorgeous, delicious and fragrant vanilla seeds? Pastry cream. Another basic recipe I want you to have in your back pocket. The pastry cream is a kind of pudding, really. And it can easily be made ahead of time. It has to chill anyhow. Make it first! You don’t need me to tell you that these are just like what you’d find in any good bakery, right? You can see for yourself. Ah, the beauty of photography, a picture telling 1000 words and all that jazz. It really is key to bake the pastries, and then turn the oven off, prop open the door and let them chillax in there for about 30 minutes. That way, they dry out a bit, which really helps them hold their shape once you fill them. The weekend is coming up. Spring has sprung! This is how to celebrate. First, prepare the cream puff pastry dough (choux pastry) according to the instructions on page 223 of GFOAS Bakes Bread (reprinted here). Cover the pastry dough with plastic wrap to prevent it from drying out, and set it aside while you make the pastry cream. Make the pastry cream. In a medium-size heavy-bottom saucepan, place the milk, sugar and salt, and whisk to combine. Bring the mixture to a simmer over medium-low heat. While the milk is coming to a simmer, in a medium, heat-safe bowl, mix together the flour blend (or cornstarch) and egg yolks until smooth. The mixture will be thick and relatively stiff. Once the milk mixture has come to a simmer, remove from the heat and drizzle the hot milk very slowly into the egg yolk mixture, whisking constantly. This is to prevent the egg yolks from scrambling, but the mixture will inevitably clump a bit. 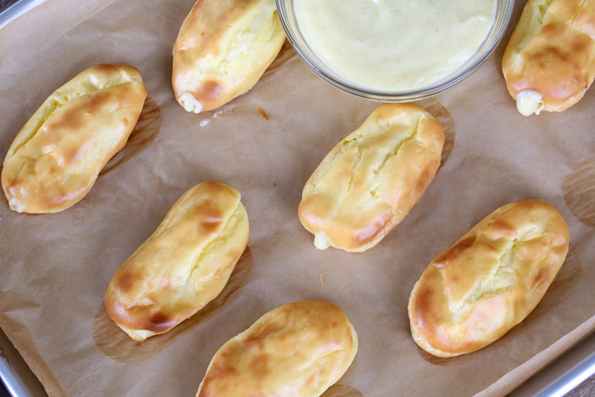 No worries—we’ll be straining the pastry cream later. Once the milk has all been added to the egg yolk mixture, transfer the whole mixture back to the saucepan and cook over medium-low heat, whisking constantly, until the pastry cream has begun to bubble and thicken (about 1 minute). Remove the saucepan from the heat, and whisk in the vanilla extract and (optional) vanilla seeds. Strain the pastry cream through a fine mesh sieve into a medium-sized bowl to remove any lumps. Continue to whisk the pastry cream until it is no longer hot to the touch. Place plastic wrap directly on the surface of the pastry cream, and refrigerate until firm (at least 30 minutes, but up to 3 days). While the pastry cream is chilling, make the pastries. Transfer the pastry dough from the blender or food processor to a pastry bag fitted with a large, plain piping tip (about 1 inch in diameter). Pipe the dough into about 14 portions about 1-inch wide and 4 inches long, about 2 inches apart, onto the prepared baking sheets. Smooth the tops of the pastry dough lightly with wet fingers so that nothing will burn during baking. Bake the pastry in the center of the preheated oven for 18 to 20 minutes, or until puffed and pale golden. Remove the baking sheet from the oven and, working quickly, with a sharp knife, cut a small slit in the side of each pastry to allow steam to escape. Return the pastries on the baking sheet to the oven, turn off the oven, and prop open the oven door slightly. Allow them to sit in the oven until dry (about 30 minutes). Once the eclairs are dry, remove the pastry cream from the refrigerator, remove the plastic wrap and transfer it to a pastry bag fitted with a small “Bismarck tube” pastry tip (I use the Ateco 230 tip, but any small tip will do). 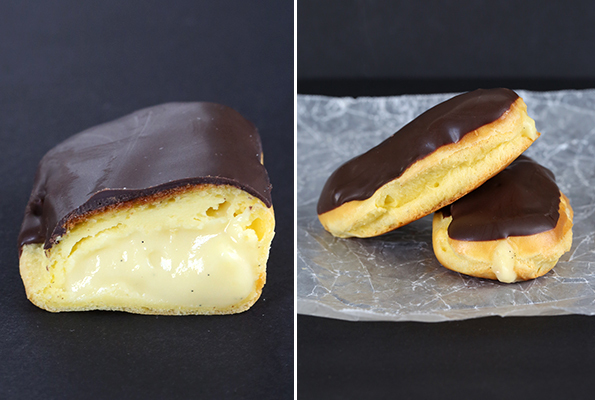 Pierce the first eclair with the pastry tip and pipe the filling inside. Repeat with the remaining eclairs. To make the chocolate topping, place the chopped chocolate and shortening in a medium-size, heat-safe bowl and melt either in short 30-second bursts in the microwave or over a simmering pot of water in a double boiler. Allow the chocolate to cool briefly before pouring the chocolate topping over each filled eclair, spreading it evenly over the top. Allow to sit at room temperature until the chocolate has set. P.S. If you haven’t yet, please pick up your copy of Bakes Bread. I’m truly so grateful for your support! I’m also dairy free will this recipe work with coconut milk? I don’t know, Pennie. I haven’t tested this recipe with any substitutions. Feel free to experiment! With the Expandex added to the flours now, will older recipes (like the Expandex-Free Eclairs and Yeasted Pizza Crust) work as well or the modified newer editions better? =D I had purchased some of the Expandex with great anticaption in baking some gluten free bread and many other recipes. There isn’t any Expandex in this recipe for éclairs, or the one I published in my second book. My older pizza crust recipe absolutely still works, as do my other previous gluten free bread recipes. But the differences the new ingredients and techniques in the Bread Book make are substantial. I truly love you Nicole Hunn! 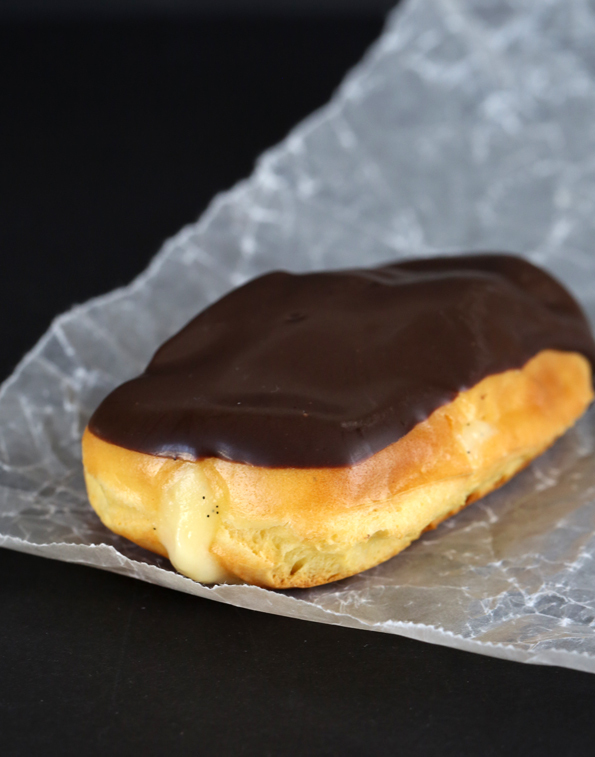 Eclairs are my absolute favorite pastry! I can almost taste them! I now must get a pastry bag and tips and attempt these! I am currently on a workout time out due to a strained calf muscle – meaning that I cannot eat any of these and I WANT TO! they look so wonderful and yummy. I miss them and now because of you we have them!!!! YAY! It is actually – especially the middle of the night cramps that make me holler. Got some acupuncture today and am putting together a stretching plan – massage on Monday… hope this all will help. so I cant help but wonder. is flour really necessary for the cream? I make banana pudding with nothing more than condensed milk, sugar and corn starch. These look yummy. Im thinking a early morning easter treat for everyone. Yes, Miranda, it is necessary for a stable pastry cream. I do not like to make puddings and pastry cream with cornstarch, as you describe in your pudding, as it “leaks” moisture as it cools. The pudding you describe is not really flourless, as it uses cornstarch.